One of the slots we’re really looking forward to giving a spin is The Wild 3. This wild west adventure comes from NextGen Gaming and the developer has given us a sneak preview of what we can expect when it’s released on the 26th of September (2018). First impressions are excellent as the design is superb. The setting is a dusty old town in the American West. On the reels you’ll see a trio of different cactus symbols alongside sticks of dynamite, bags a money, gold bars, safes, the town bank and a character called Voltimer Vulture. The Wild 3 will live up to its name courtesy if the Racoon, Coyote and Bull symbols, all of which are wild. Hope to hit them on the middle reel as they can serve up some pretty tasty extras when they do. The Racoon is in play at all stake levels. It adds extra wilds to the reels when it lands on the middle reel. Activating Super Bet by upping your stakes to 15 or 20 coins per spin brings the Wild Coyote and Bull extras into play. The Coyote on reel 3 turns the lower value cactus symbols wild while the Bull delivers a random multiplier boost of between 2x and 10x if it forms part of a winner. 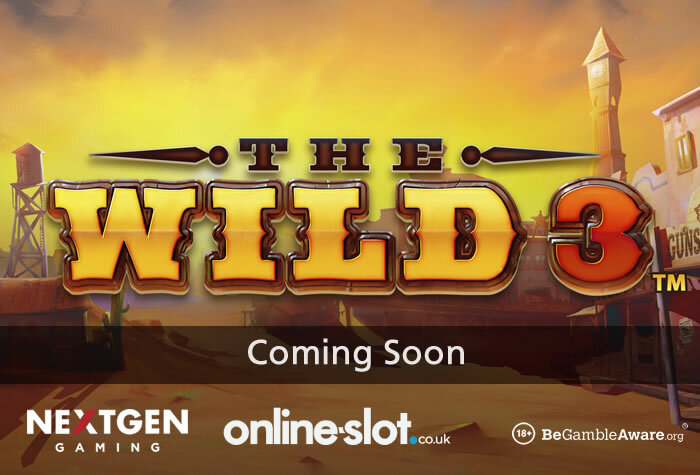 The Wild 3 will also offer a Free Games feature which awards 5 free spins with sticky wilds (the only exception being the Racoon or Coyote wilds on reel 3). Any wilds that hit during this feature turn sticky too. Any Bonus symbol that hits will add another free spin to your total. The wild features from the base game will also come into play meaning wild multipliers up to 10x can be on offer. Just miss out on landing the free spins and you’ll receive the Lock ‘N’ Load Respins feature which offer a second bite of the bonus cherry. At the start of the game you’ll be set a number of missions. Complete your set of 3 and you’ll open up the Rob the Rich feature which is a classic pick me round. Until it’s release, you can play Kingdom’s Edge – NextGen Gaming’s latest slot. With a fantasy/epic/medieval theme, this 5 reel, 20 payline offering can be played from just 10p per spin across all compatible devices. There’s a Rally the Troops feature where you’ll benefit from a sticky gold wild reel and silver wilds that expand to give you wild reels – the multiplier will also reach up to 5x. I really like the Defend the Gates Free Games feature where infinite free spins can be won – the Rally the Troops feature comes into play meaning lots of wild reels and multipliers up to 5x will be awarded. This high variance game offers you payouts of 3,000 times your stake on every spin.